Students, faculty, and local art buffs packed Schmucker Art Gallery here at Gettysburg College on October 25th to hear CWI Director, Peter Carmichael talk about visual depictions of warfare. The talk was given as a part of the ongoing exhibition, “The Plains of Mars: European War Prints 1500-1815,” which features an array of war prints depicting a range of both heroic and tragic moments of warfare. This semester I have been closely studying and writing about 19th-century images of warfare to help curate a photography exhibit for this summer’s CWI Conference, so I was intrigued by what Dr. Carmichael had to say about the artwork of war. Carmichael began his talk on a personal note, explaining how his introduction to Civil War visual culture began with Bill Frassanito’s book, Gettysburg: A Photographic Journey in Time. As a child on vacation in Disney, Carmichael much preferred the book to anything the amusement park had to offer. The book, a product of Frassanito’s scouring of the battlefield for more than five years, gave the young Carmichael a sense of time travel. The young Carmichael was fascinated by the side- by- side comparison of historic photos and Frassanito’s modern photos of the battlefield. Frassanito followed his books on Gettysburg with a book of the photographs of Antietam, which are more graphic than the photographs from Gettysburg. Following Frassanito’s lead, Carmichael transported the attendees back to the blood-soaked fields of Antietam by showing images of dead Confederates near Hagerstown Turnpike. These Antietam photos, taken by Alexander Gardner, were presented at Mathew Brady’s New York Gallery. Brady exhibited the photos in all of their gory detail, which earned him the scorn of numerous individuals who criticized his “unseemly” artwork. Following the exhibition of the prints, an unsigned New York Times editorial blasted viewers who pulled out magnifying glasses to inspect the gore in the photos, and through such voyeuristic enthusiasm, completely disregarded the humanity of the dead. The unknown editorial author was disappointed and disgusted by the public’s morbid fascination with the photos. Ultimately, the reason the author was disappointed with the images was because they challenged northern civilians’ romantic notions of death by showing the horrors of battlefield realities. The images Gardner took were also published in Harpers Weekly as woodcuts, but these were sanitized of their grislier aspects. A woodcut of Burnside’s Bridge dominated a page of Harpers Weekly in October 1862, but for all the hard fighting that happened there, there was no destruction and death seen in the woodcut. Rather, the woodcut simply depicts two soldiers marching side by side towards the bridge. The emphasis is not on the men, though, it’s on the landscape. However, the land around the bridge has been cleared of any evidence of battle. Carmichael emphasized that what many members of the northern public were being shown as the horrors of war was actually a sanitized version of the gruesome reality. Other images published in the paper used shadowing and other doctoring techniques to obscure the more unpalatable images. The woodcuts of dead bodies could be just as jarring to the northern public, without being as offensive as the gore in the original photographs. The result of this doctoring was a public that thought they had experienced war, but had only experienced an image in a newspaper. Although sanitized, these images were still shocking enough to cause significant political ramifications in the North. The images made the public contemplate the war’s purpose, especially as that purpose was altered after the battle of Antietam. The sacrifice of the soldiers captured in the images gave President Abraham Lincoln the political clout to announce the Emancipation Proclamation, which meant the Union dead had not died in vain. Their sacrifice gave Lincoln the stalemate, if not outright victory, he needed to be able to issue the Proclamation from a position of strength and legitimacy. The images softened public reaction to the Emancipation Proclamation, demonstrating to the northern public the necessity of the Proclamation to bring an end to the war. Not only did the photos influence the public’s political views, they also reflected the shift in how the public engaged with and understood war. Carmichael spoke about the large role photographs play in influencing the way we remember events. He illustrated this by showing a picture of a Vietnam soldier whose forlorn face pulls on the heartstrings of the audience. Seeing the young man in distress reinforces the notion that war is inherently bad. However, Carmichael challenged the audience to look deeper for different interpretations of warfare as he presented more modern Civil War art. Pointing to one image that showcased a defiant Robert E. Lee at Appomattox, Carmichael noted that the artist sought to celebrate the heroic, or at least more noble aspects of war by creating a definitive homage to Lee and perhaps also offering a justification of the Confederate cause. The image does not condemn Lee or the Confederate cause, nor is there any reference to the issue of slavery that the war had been fought over. Rather than having Traveller (Lee’s horse) droop his head in defeat, Traveller’s head is raised and defiant. Traveller, like his owner, would not show deference to the United States. 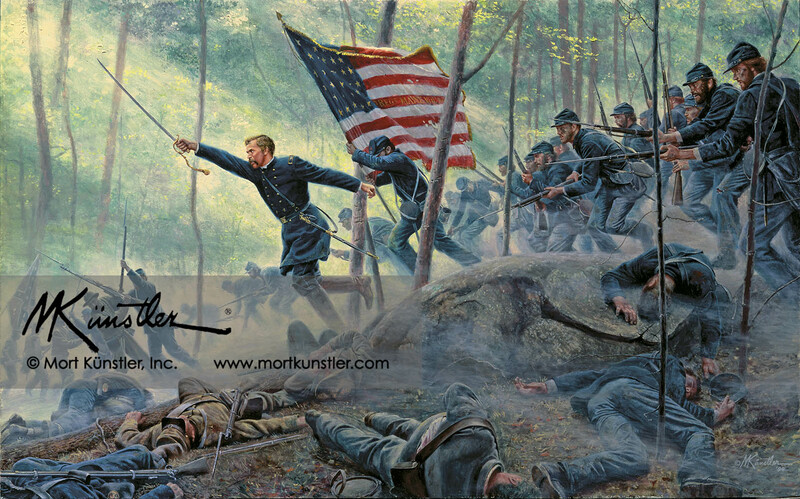 Similarly, a painting by Mort Kunstler of Joshua Chamberlain leading the 20th Maine down the slope of Little Round Top embodies the individual heroism that we want to believe carried the day on July 2 at Gettysburg. The heroic Chamberlain leads the 20th Maine in a gallant charge, and the only visible casualties have their faces covered and blend in with the dark ground. Behind Chamberlain, a massive United States flag is unfurled in one of the ultimate shows of patriotism. These works, which border on romanticizing war and soldiering, present a stark contrast to other works currently on display at Schmucker Gallery, like Jean Pierre Marie Jazet’s defeated French Soldier after Waterloo. This image focuses on a lone soldier sitting on a rock, a shovel in one hand and his head propped by the other hand. The soldier stares into the distance, no doubt contemplating his task of burying his fallen comrade, upon whom he has his wounded leg propped. He is too exhausted, or devastated, to even honor a fallen comrade. Carmichael explored how this image resonates with a modern audience because it validates what we have come to believe about war since Vietnam –that it destroys the emotional and mental state of the soldier who is nothing more than a tragic pawn caught in a deadly chess match. In juxtaposing strictly heroic portrayals of warfare with images that spoke solely to the dehumanizing influences of war, Carmichael opened an effective window to discuss what war art continually lacks: A complex narrative. Carmichael emphasized the value of certain artistic tropes that armed conflict is inherently graphic, and he noted that the “Plains of Mars” exhibition is a necessary check on militarism because the exhibition displays the peril of war. However, Carmichael argued that war art has increasingly turned away from acknowledging that a heroic sacrifice for political reasons—namely, cause and country–does in fact exist. To validate his point, Carmichael showed the audience a painting done by Don Troiani of the 24th Michigan fighting on the first day of the battle of Gettysburg. The 24th Michigan’s battle flag is a symbol for the political causes endangered by secession, with that flag demanding courage of the men fighting under it. The battle flags amidst their ranks were made by their wives and sweethearts at home, often even sewn from wedding dress fabric. This knowledge drives home the idea that the men were fighting for their loved ones, in addition to fighting for their nation. This image plays into Carmichael’s lament that, since the Vietnam War, art has not portrayed the soldier as anything but a tragic pawn. Since Vietnam, the public has transitioned from romanticizing conflict to a cynicism about war. In general, a modern war image emphasizes the heroism of the act of fighting, but will not go as far as to confer heroic status onto those fighting. Despite the painting’s strengths, however, Carmichael still critiqued the lack of blood and fear amongst the men, arguing that war art needs to have a more complex narrative than even this Troiani piece, with subjects demonstrating characteristics other than heroic tropes. For all its strong political symbolism, the painting lacks reflection on the true horrors of war. Carmichael then explored the political ramifications of war art, which can leave a long-lasting impact on a nation. Carmichael showed the audience pictures of Gordon, also known as “whipped Peter” whose scourged back from years of whippings while enslaved made him a symbol of the abolitionist cause. Gordon later enlisted in the Union army. Carmichael presented an image of Gordon in his uniform but noted that, for African Americans, it was not as simple as wearing the Union blue to achieve freedom. Gordon had gone from an enslaved man to a soldier, from “property” to hero. Images of Gordon reminded northern audiences that it took risk, and indeed sacrifice, to achieve the larger goal of liberty. As he concluded his talk, Carmichael addressed the importance of images from the Civil War in reminding us that the great bloodletting and sacrifice of human life was done with the awareness that the nation’s future rested on individual heroism. Art can change how people actively view and remember events, allowing the malleable historical narrative to be shaped by influential images. An image can emphasize or sanitize a point of view, emotion, or event in the public consciousness, as photographs and woodcuts did during the Civil War. Carmichael asked the audience a hard-hitting question in conclusion: Should we remember the Civil War as a moment solely of heroic triumph? The art that has stuck in public memory of the Civil War does not give us full understanding of that conflict. We have to look deeper into the images. The Harpers Weekly woodcuts from Antietam depict corpses, but ignore images of grieving widows and orphans. Only on contemplation do we think of the families and the physical and emotional burdens they endured. And yet, even in their grief, these widows and orphans were individuals who understood that the sacrifice of their loved one was a part of a large and meaningful cause. For Civil War era Americans, imagery was key to reinforcing the importance of the individual, and the ability of the individual to ‘win the day’ with an act of heroism. These individuals did as much as anyone could do to advance the cause. Their sacrifice had to be made for a larger purpose. The images reminded those on the home front of the heroic, even if at times grisly, struggle. Walking away from the gallery, I couldn’t help but reflect on one of the photographs from my own research this semester. The photo depicts the unidentified body of a Confederate soldier at Devil’s Den. This image, which was once difficult to look at, has become a common part of my day. The more I look at the image, the deeper connection I feel to the young man, who could be just about my own age. It hit home for me when Carmichael referenced the grieving families. The mangled body that northern audiences gawked at in the image was someone’s son. The young soldier had a family that loved and cared for him, and yet he became something for gallery visitors to gawk at. The image does not convey how his loved ones grieved, or what his death meant for the national struggle. Those narratives are for the historian to reconstruct. Thanks, Cameron, for this informative and introspective piece. I agree, many paintings I’ve seen are like Künstler’s Chamberlain, bloodless and over-emphasizing heroics. Making a more powerful impression to me is Jazet’s French Soldier, also bloodless despite severed limbs, but the emotional and physical impact of war is evident in the soldier’s face. Great idea to embed hypertext links, so we can see the paintings you are describing. You very well express Dr. Carmichael’s characterization of how art can change a person’s perception of war. I enjoy his talks; he is expressive and engaging.